They say India is a land of opportunities, but for years these opportunities were untapped due to lack of leadership, absence of the will to guide the talent and potential to break the barriers in order to raise the bar in the global order. 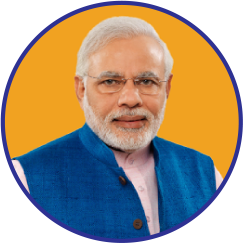 Under the dynamic and visionary leadership of Prime Minister Narendra Modi, the nation stepped into light from darkness on 26th May, 2014 after a decade of red-tapism, rampant corruption and zero governance. Under the mantra of Sabka Saath, Sabka Vikas, the Narendra Modi led government at the Centre through its tireless striving has opened up a new realm for India’s economy with empowerment of various sections, primarily the weaker and backward sections of the society which were till now only considered a vote-bank by previous regimes to apply their policies of appeasement. The Centre has not only emphasized on development and empowerment of the downtrodden but has also provided an environment for ”Ease of Doing Business” for the small scale industries and entrepreneurs. The Industrial Growth rate has gone up to 7.5% (as on January, 2018). Also in January, 2018, the Index of Industrial Production (IIP) rose to 132.3 points which is 7.5% higher than January, 2017. Some of the highlights of other sectors are not just mind boggling but also reflect the robust growth of the nation in terms of economy and employment opportunities. India’s automobile sector vrooms to fourth position in the world! The constant encouragement and support to new-age entrepreneurs complemented by purchasing power parity along with the organized Goods and Services Tax (GST) has led to demand of vehicles among the youth and the middle class. There has been a considerable jump in automobile manufacturing and India has surpassed Germany to become the world’s fourth largest automobile industry. The sale of commercial as well as passenger vehicles registered a 9.5% growth rate and 4 million vehicles were sold in the year 2017. The aim to boost the Centre’s Make in India initiative has starting reaping benefits with the Ease of Doing Business mantra. Make in India, an idea envisioned by PM Modi has been able to create a conducive ecosystem for investments, innovations, skill development and optimum utilization of resources. India has overtaken Japan in terms of stainless steel manufacturing and has gained the second spot in the world, catching up with China rapidly. From 3 million units in 2014 to the current number of 11 million units, that’s how mobile phones are ringing in a new era in India’s digital space and subsequent growth story. We have toppled Vietnam and registered ourselves as the second largest mobile makers in the world. According to the Fast Track Task Force (FTTF) under the Ministry of Electronics and Information Technology, the manufacturing of mobile phones would reach 50 crore units per year by 2019. This transformation has led to a positive impact in terms of employment generation. Since 2014, there have been 4 lakh jobs under the mobile phone industry, of which 2.4 lakh jobs were generated in the year 2017 itself. STEELing the second spot in the world! Faster growth in production output and industrial development have been key areas of focus under the Narendra Modi led government. With renewed spirit and policy formulation, India has emerged as a major industrial force in the global arena. The steel industry has garnered major boost in this regard. As per the data released by the International Stainless Steel Forum (ISSF), stainless steel manufacturing for the year 2016 went up to 33.2 lakh tonnes as compared to 30 lakh tonnes in 2015 which was almost 9% higher. The Narendra Modi government is constantly working towards providing 24 hours of electricity to every household in India by April, 2019. These efforts have boosted India’s position and placed it at the third spot in the world among the largest electricity producing nations. According to India Brand Equity Foundation (IBEF) report released in February this year, from April 2017 till January 2018, electricity production has been 1003.525 billion units. In comparison with data seven years back, electricity production in 2017 went up to a whopping 34%. India is leaving no stone unturned to reach the level of 100 GW electricity production by the year 2022. In order to achieve this target, the government and the concerned departments are focusing on the use of hydro, gas, solar and other forms of renewable energy. It does not stop here, India is also targeting 60 GW wind energy production along with 100 GW of solar energy by the year 2022 with the idea of electrifying a New India. Today, India is buzzing with the energy and ideas of Yuva Shakti which has been given a hope and platform by the leadership of PM Narendra Modi in a new world order with innovation in technology and robust growth across all sectors. A recent World Bank report states that with the bold and decisive strategies undertaken by the current government, India is well poised to create another Silicon Valley in its own backyard. In the end, I would say that the time has gone when we used to say that India will be a super-power in the future, because India is already a global force to reckon with and the continuous growth story will usher in a New India as dreamt by PM Narendra Modi with equal opportunities and a regeneration of its inner power.